Arfvedsonite with telescoping termination and quartz, in iron stained miarolitic cavity, North Cascade Highway, milepost 166 collecting area. Photomicrograph © Saul Krotki 2013 (.1325). Field of view 4.0 mm. Krotki field trip May 2013. 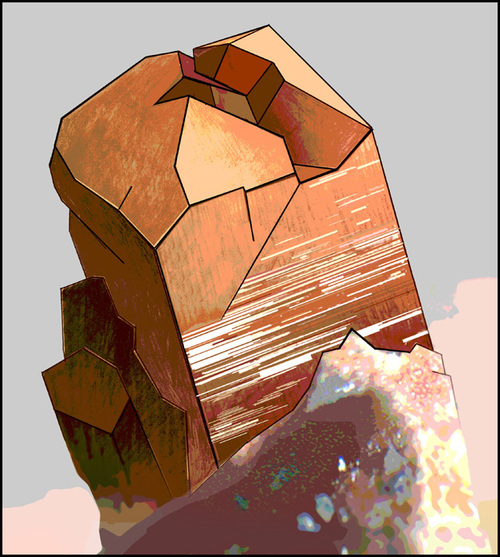 Zircon with four-section pyramid termination. Washington Pass, North Cascade Highway, milepost 166, Okanogan Co., WA. Drawing idealized from photomicrograph © Saul Krotki 2010 (.1066), field of view 2.0 mm. 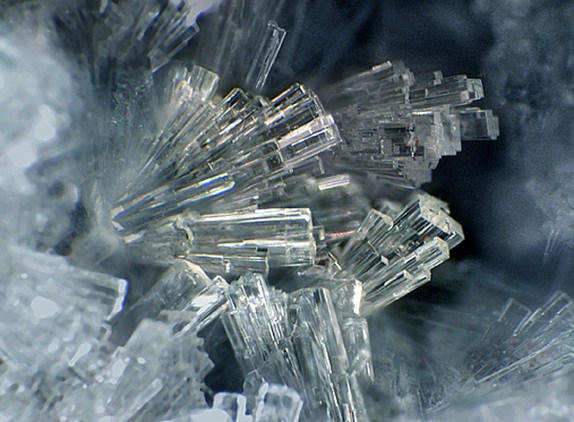 These crystals were collected by Kristin Lindell in the Willow Creek area near Washington Pass, Okanogan Co., Washington. 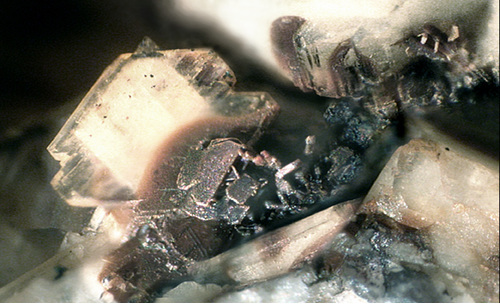 The miarolitic cavity that produced these crystals was unique, for the included needles of astrophyllite, did not occur in any of the other cavities that were discovered in 2009. On the left a cluster 14 mm across. On the right detail with astrophyllite inclustions, 3.4 mm wide. Photomicrograph © Saul Krotki 2010(.1035). Photomicrograph © Saul Krotki 2010 (.1036.3). Field of view 4.0 mm. Photomicrograph © Saul Krotki 2010 (.1027). 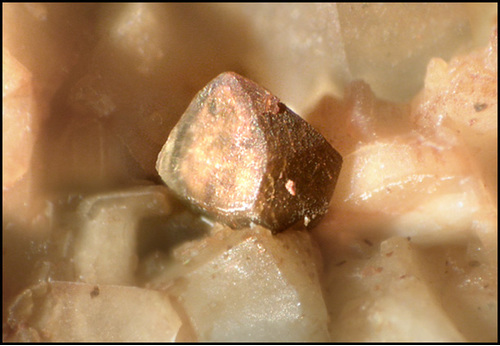 12.0 mm area of thumbnail size matrix specimen. Krotki Micromount Collection. 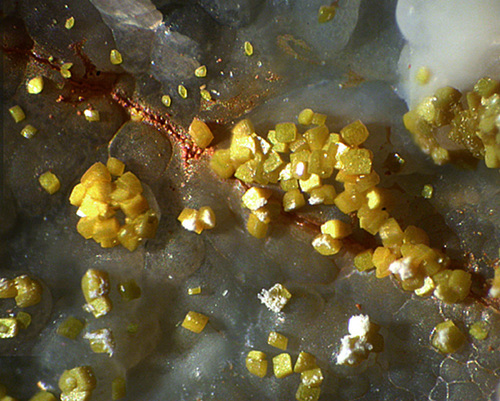 Iron diffusion halo surrounding a cluster of flattened zircon crystals, on microcline overgrown with albite. The zircon has been verified by EDS analysis. Several minute, but very odd zircon clusters, have been found in boulders at the North Cascade Highway, milepost 165 avalanche chute. Photomicrograph © Saul Krotki 2010 (.1023). Field of view 2.5 mm. Krotki field trip, August 2009. Krotki Micromount Collection. 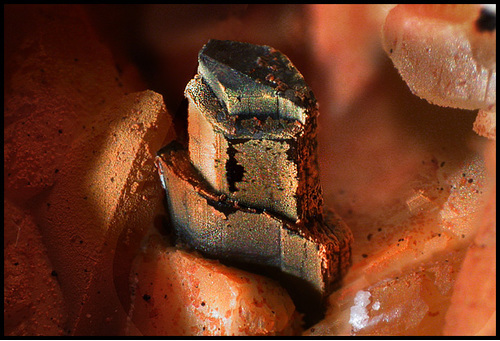 An isolated well-formed single crystal of gadolinite-(Ce), North Cascade Highway, milepost 165, Okanogan Co., WA. Photomicrograph © Saul Krotki 2010 (.1021). Field of view 2.5 mm. Saul Krotki field trip, August 2009. Krotki Micromount Collection. 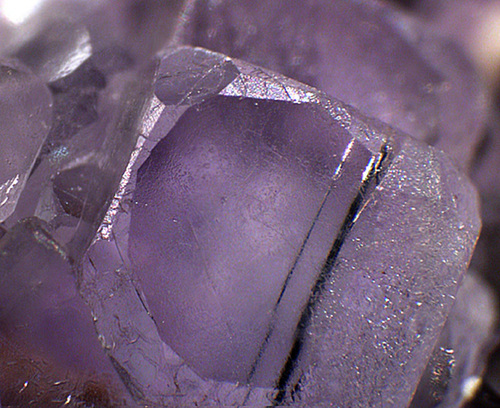 Fluorite cube with hexoctahedral modifications. 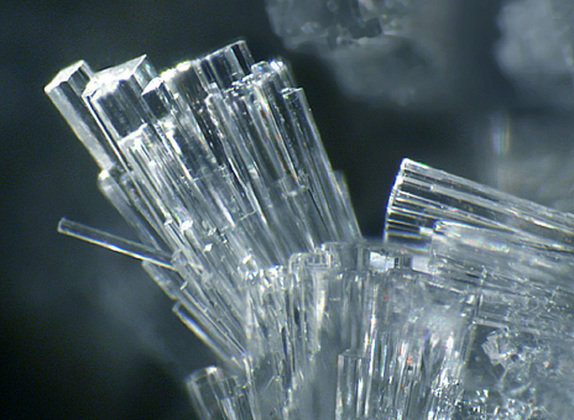 Prevalent twining obscured the idea "crystal model" complete form. Photomicrograph © Saul Krotki 2010 (.1080.2. Field of view 4.0 mm. 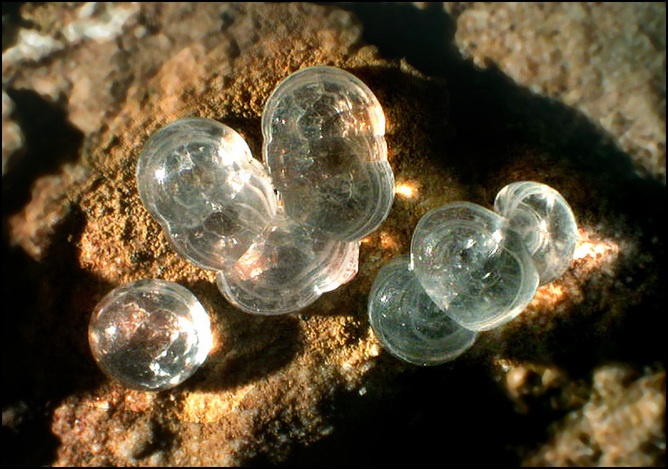 Micromineral specimen provided for this study by Brian Carney. Specimen provided by Brian Carney. Photomicrograph © Saul Krotki 2010 (.1020.1). Field of view 2.4 mm wide. Krotki Micromount Collection. Specimen provided by Brian Carney. Photomicrograph © Saul Krotki 2010 (.1020.2). Field of view 4.0 mm wide. Krotki Micromount Collection.